The development of Baja Med as a cuisine coincided with – even if it was not exactly caused by – a renewed focus amongst chefs in the region on Baja California’s natural bounty. 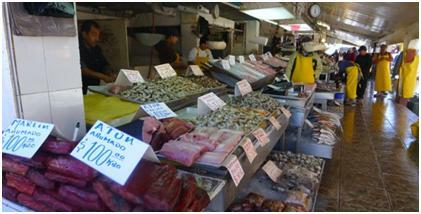 From the thousands of miles of coastline come the fish and seafood that stock Ensenada’s superm Mercado de Mariscos. From its fertile valleys, licked by ocean breezes, come olives, wine and many other brilliant products. Baja and Northern Mexico have always been known, for example, for having the best beef in Mexico. Less well known is just how good the chicken is on the south side of the border. Cross through the swinging, clanking metal gate, find a carniceria or Calimax and look for the yellow-skinned birds that look just like the ones we get north of the border, only different; only more yellow. And whatever it is that makes those birds look more yellow apparently also makes them taste better: more like chicken and with a deeper, meatier, and more intense flavor. 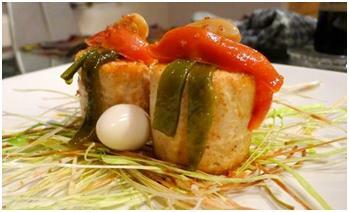 It is with that in mind that I set about making a new Baja Med dish: Bird’s Nest of Leeks and Chicken with Three Confits. The birds nest itself I made by slicing leeks very thinly and then frying them. Instead of deep frying them, though, I achieved much the same effect by putting them in a microwave oven at about 800 watts (about 2/3 power me) for 3 minutes on a plate brushed ever-so-slightly with grapeseed oil (a technique adapted from Modernist Cuisine at Home by Nathan Myhrvold and Maxime Bilet). The birds themselves are chicken breasts, pureed in the food processor with egg and spices. And what would a bird’s nest be without some bird eggs? The entire affair is garnished with three confits: tomato, poblano chile and garlic. Make the Confits. Place the poblano chile pepper strips in a sauce pan and cover the strips with olive oil. Bring just to a boil over high heat and immediately reduce to a simmer. Place the chopped tomato and the garlic cloves in another sauce pan and cover with olive oil. Bring just to a boil over high heat and immediately reduce to a simmer. Make the Chicken. Working in batches, process the chicken in a food processor fitted with the metal blade until smooth. Add the seasonings and pulse the food processor several times until combined. Add the eggs and process again, just long enough to combine. Scrape the sides and process the filling again to combine the scrapings. Cook the Chicken. Place a large, rectangular run of plastic wrap on a flat surface. Spoon a rough “log” of the chicken mixture running horizontally along the middle of the rectangle. Fold the bottom of the plastic wrap over the log and roll, sushi-style into about a 6 inch log. Twist one end and tie it off with some string. Twist the other end, squeezing it down (and squeezing out air bubbles) before tying it off, as well. Repeat with the remaining chicken. Put the chicken logs in a Sous-Vide machine and cook at 140° for 2 hours. “Fry” the Leeks. Lightly brush oil on a large plate. The entire plate should be oiled but the layer should be extremely thin. Arrange leek strips on the plate (you will have to work in batches). Set your microwave oven to 800 watts (the precise strength setting will depend on the total maximum wattage of your microwave oven; for me it was 6) and fry the leek strips for about 3 minutes, until the strips are just crunchy and beginning to brown. Sear the Chicken. Cut the oval ends off of the chicken logs and slice them into even, cylindrical sections. Heat about two teaspoons of grapeseed oil over high heat in a pan. When extremely hot, sear the chicken sections on all surfaces to the point that they are just starting to take on caramelized color. Remove from the pan. Plate the Dish. Arrange the fried leeks on each plate to resemble a bird’s nest. Place two pieces of chicken on each bird’s nest. Garnish each piece of chicken with two strips of poblano confit, one piece of tomato confit and one clove of garlic confit. 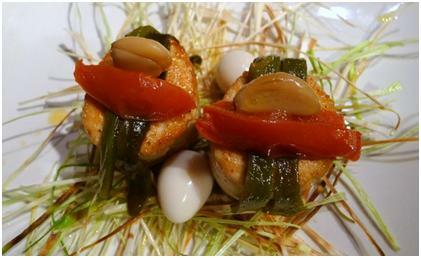 Arrange two quail eggs on each nest. Drizzle the chicken pieces with some lime juice.